Hello Beneath My Heart readers!! 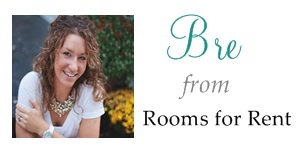 It’s Bre, from Rooms FOR Rent blog, and I’m so happy to be back with all you today! Today I’m sharing with you how I decorate around a modern black sofa. If you have visited my blog, than you already know my style is not modern, nor do I own a black leather sofa. I am a white slip-covered girl through and through. However, I have yet to meet a client who is on the white-slip covered band wagon. 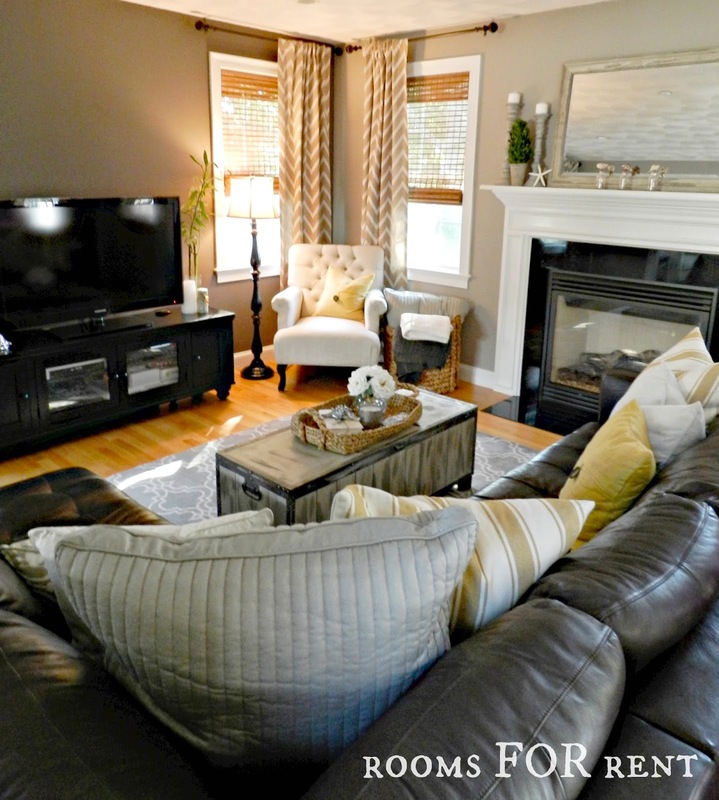 In fact my last 4 clients have all owned dark leather sofa’s, yet they are craving a lighter, fresh, cozier look. But guess what, that dark leather sofa is not going anywhere. Nope! It’s here to stay. Ok, so first things first! We painted their walls. Before was what I call “builder beige,” that peachy-bone color, that did nothing but make this large black leather sectional stick out, and command all the attention in the room. 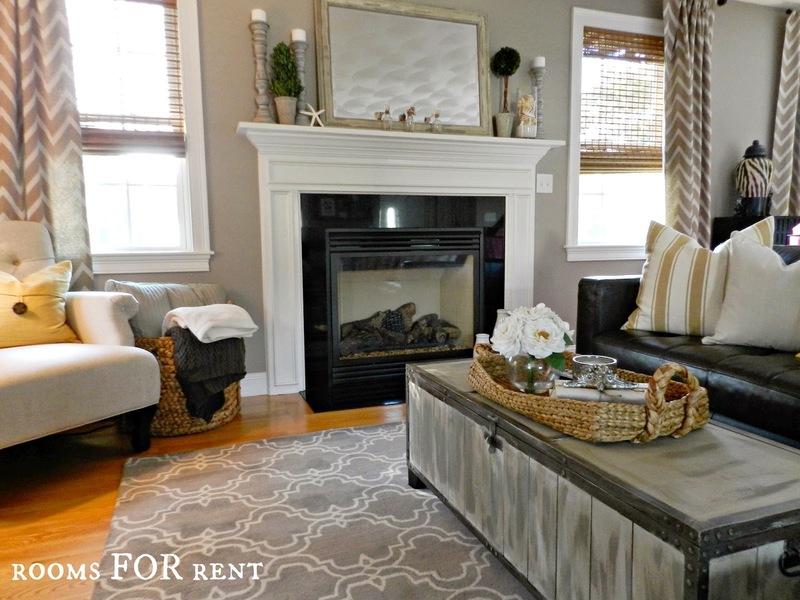 I chose warm neutral colors to warm up the space and take away all the attention from the sofa. Creating a dark accent wall directly across the sofa, helped balance the space, and blend the tv in, which was a win-win in my book. The homeowner was really craving a space that felt warm, cozy and lived in, so the next step was adding curtains to warm up the cold bare windows. The only furniture in the space was the large leather sectional, modern glass coffee table, and flat screen tv on a sleek black stand. I created a cozy reading corner in the space by bringing in an accent chair in a creamy linen. To balance the once sleek modern look, I brought in a weathered trunk for a coffee table that I custom painted to fit the space. 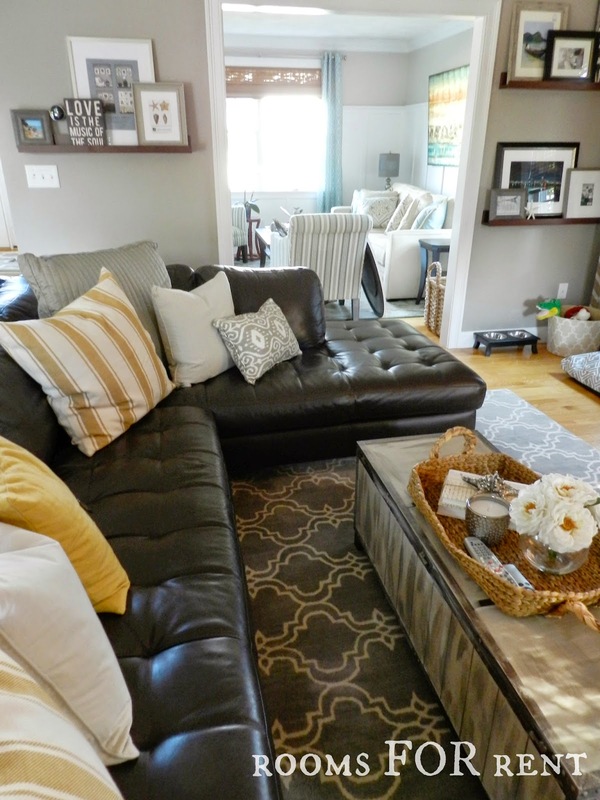 We swapped out the too-small shag rug for a trellis patterned in a neutral hue to add interest to the space, and again take the attention off the sofa. Loading the sofa up with lots of fun throw pillows not only makes the space feel cozy, but softens the look of the modern leather. 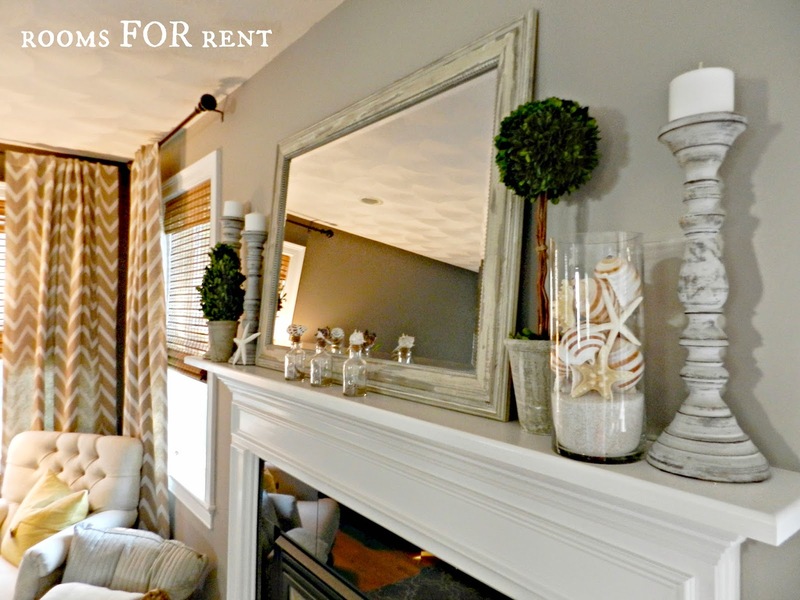 Even though the mantle plays no part in how the sofa looks technically, it still plays a key part in the rooms decor. Seen below in the before, it was decorated with too much of the same thing…rectangle metal frames, not really holding it’s own as a focal point, but just feeling kind of blah. I left the original mirror, because it was a great size for the mantle, but instead of frames, I brought in weathered wooden candle sticks, faux boxwood topiaries, and seashells, for lots of texture and interest. Now, we had a mantle that would truly take center stage in this family room and not be washed out by one very large distracting leather sofa. After completing this install, my client was given the space she craved with the sofa her husband loved. While adding accent pillows and cozy throw blankets to your sofa will help soften it’s look, remember to look all around your room at other areas you can change and tweak to help balance out any distracting furniture you might have. Sometimes it’s not always just changing the most obvious piece, but learning how to work around it for a more blended look! This looks awesome, Brie! Love all the pattern and textures. We too have leather, now in our family room, and we love it. I just bought new fabric to lighten up ours too. What color did you paint the walls? We have the same problem with our leather furniture – trying to lighten it up as I know the hubby would never do well with a white slipcovered sofa! I feel like most of my den is a shade of brown or beige and if I take from this post I think I could really lighten it up! Beautiful room. what two color grays did you use? Absolutely BEAUTIFUL after you got done with it! I love the trunk coffee table. 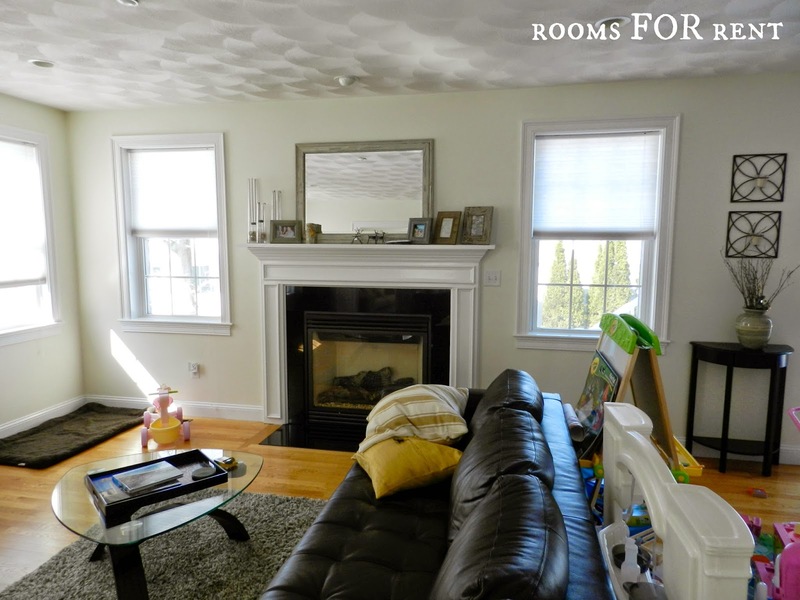 The room went from being cold and unwelcoming to warm and very inviting! Your client must have been so so happy! Gorgeous!! We just moved to Bend, OR and the movers stole everything we own. Trying to redecorate after years of collecting things for our spaces is daunting. 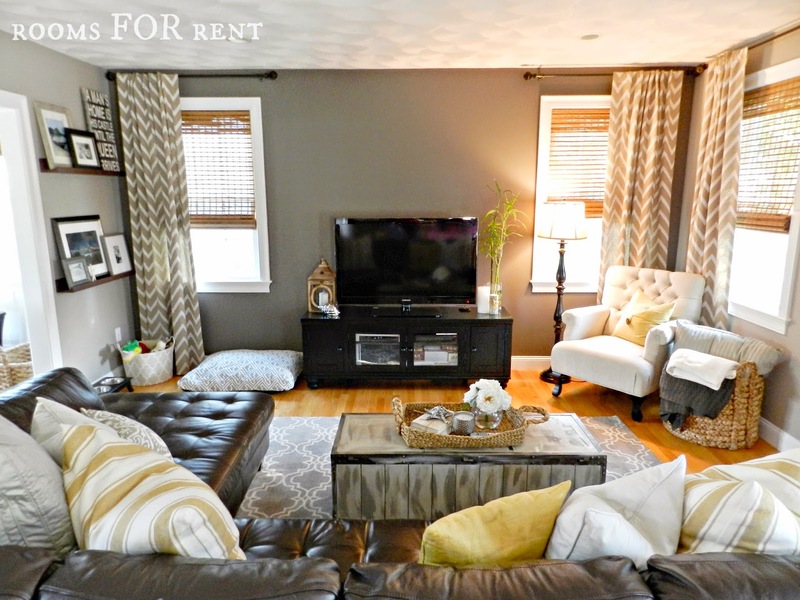 I found your blog post because my husband really wanted to back to brown leather couches since we had to buy new ones. We used to have a gray slip covered couch which was more my style. I am attempting to bring in the same lighter coziness to the space now. I used to have almost all the same sort of things in my old family room as this room you restyled, even down to the shells and sea grass tray and basket. Would you help me get started on located these comfy looking pillows? I just love how those toned down the couch’s coldness. Thank you! Awesome transformation! I love it. The pillows and window treatments really soften this room and the darker wall color is wonderful. 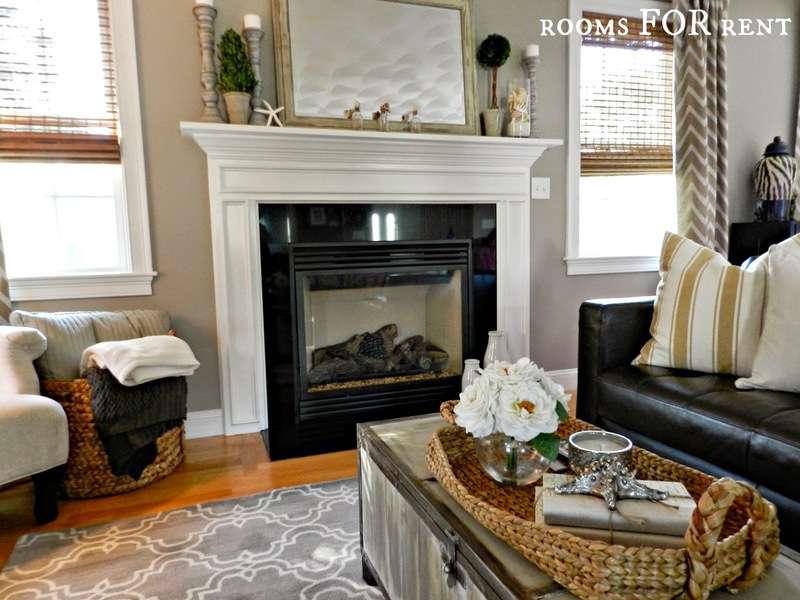 You really transformed this cold stark decor into a warm and cozy room. A great place to curl up and watch a good movie. I love it, it looks so inviting. Now THAT’s a room makeover. Absolutely stunning transformation. Wow! What an incredible makeover. I see the same kind of man-size sofa over and over again and I completely shy away from it simply because the proportion scares me. You’ve done an incredible job of blending in the scale and warming up the entire space so everything just melds together in a comfy-cozy way. Love it! What an amazing transformation you got here! It looks way more comfortable and stylish. I also love what you did with the curtains! It definitely makes the space cozier. I’d love to know where that rug is from? Beautiful room! Could you share the name of the paint color used and where you got the curtains? Thank you so much! I love these wall colors… do you know what they are? I’m getting a brown leather sectional and stumped on making my apartment white walls look better but not closing it off. 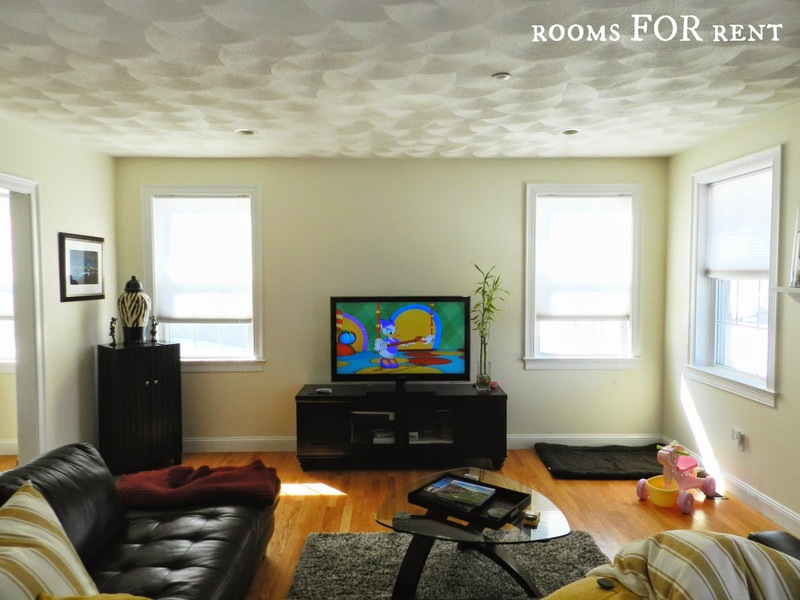 Bri – My room looks so much like the before picture! I am totally frustrated trying to figure out what to paint the walls. Can you please share the color? I am so excited and inspired – please help!! Gave me such inspiration for my son’s recent thrift store purchase of a brown leather sofa and loveseat. found great pillows at West elm. Please share the wall color name. Can you share the name and brand of paint in the update room? Looks great! can you please tell me the brand of that leather couch/sectional? Just discovered your post, it made me smile as I’m in exactly the same situation! 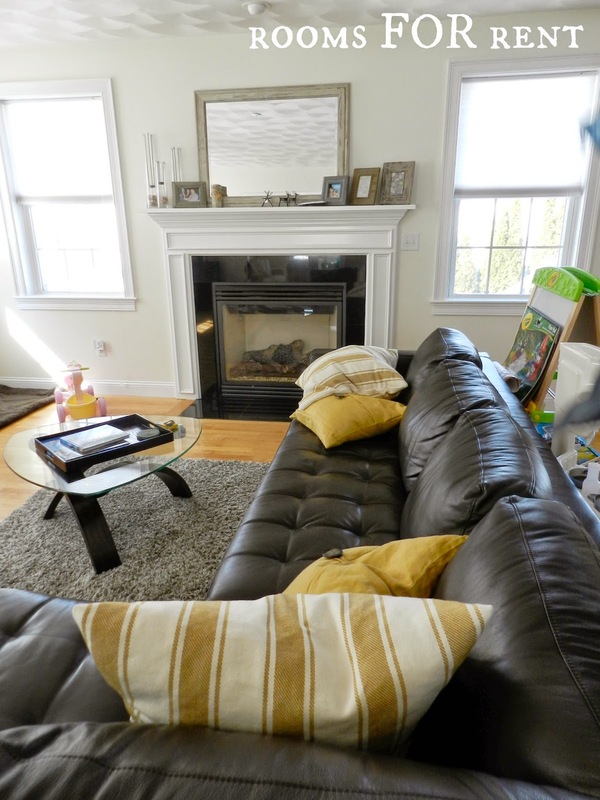 We have just bought our first home after renting for a while and I’m looking to create the lounge I want with the brown corner sofa my hubby will not part from. Loads of good bits of advise, thank you! My boyfriend and I have decided to give up our individual apartments and move in together after 5 years of dating. Unfortunately, he is insisting on keeping his black leather couches and I’ve only agreed because they are extremely soft and comfortable, but truthfully I absolutely hate the look of them. I’m afraid that our living room will end up looking like a dark, uninviting cold dungeon. I’ve been racking my brain, searching endlessly for design inspiration, but haven’t found anything that fits both of our styles. That was until I found your amazing den makeover. This room design is exactly what I’ve been imagining in my head but couldn’t articulate or organize my ideas. You are so talented and truly turned this family’s den into such a warm and inviting place for them to spend many hours of quality time together. Now, I can’t wait to start designing my living room and I just hop that I can create something just as special as the room you created. I look forward to further posts on this website. Keep up the good work Bre! A lot of people would like to know what paint color/brand did you use but you haven’t replied. I also have been browsing thought your whole blog just to find the color. Can you please update us with the name of the wall paint you used? Thank you! Lucy, I am sorry, but that is not my den. It was a guest blogger, so I do not have that information. Thank you.